Microsoft has begun to deliver the Windows 10 upgrade to eligible Windows 7 and Windows 8.1 PCs through Windows Update, making good on an October announcement. 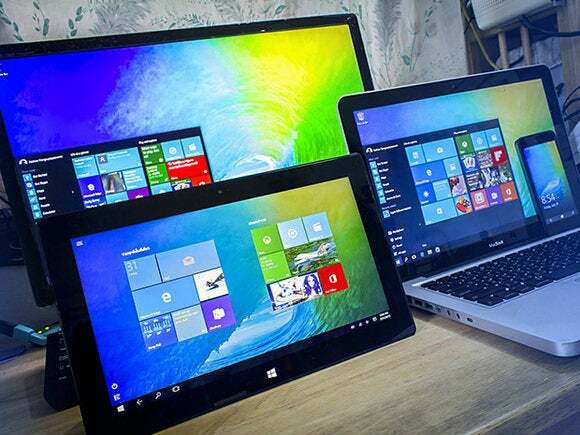 A company spokeswoman confirmed that the Windows 10 upgrade is reaching customers' systems. At the time, Myerson said that the upgrade would first appear under the "Optional" section in Windows Update, then later transit to "Recommended." The difference is more than labeling: In Windows Update, "Optional" is supposed to be just that; customers must explicitly check the box for an item for it to automatically download and install. "Recommended" items, on the other hand, will be retrieved and installed unless the user has changed the default settings of Windows Update. In the past, Microsoft has issued updates and upgrades in that two-step process under which bits first appeared under Optional, then after a month or more -- a span Microsoft used to digest diagnostic data from affected PCs to ensure things worked as expected -- the same update shifted to Recommended, and reached the majority of users. It's unclear whether Microsoft is following the plan it laid out in October: While several prominent bloggers who focus on Microsoft -- including Paul Thurrott and ZDNet's Mary Jo Foley -- said that the Windows 10 upgrade had been deployed as Recommended in Windows Update, there was no explicit evidence that that had, in fact, begun. But the Windows 10 upgrade has appeared under Windows Update's Optional list, according to Josh Mayfield, the creator of GWX Control Panel. The free utility made Microsoft's Get Windows 10 (hence "GWX") upgrade reservation app go away, purged the system of upgrade files, and blocked the automatic upgrade. Mayfield maintains a multiple-PC pool of test machines to monitor how Microsoft promotes Windows 10. Yesterday, he confirmed that the upgrade showed up under Optional on both Windows 7 and Windows 8.1 PCs. "As we saw over the summer, it's listed as an 'Optional' update but automatically selected to install, unlike other updates in that category," said Mayfield in an email reply to questions Tuesday. Mayfield was referring to events that began in mid-September at the latest, when users noticed "Upgrade to Windows 10 Home" or "Upgrade to Windows 10 Pro," in Windows Update. Those items appeared in the Optional section of Windows Update's listing of available patches and fixes. Normally, updates pegged as Optional will not download to a PC -- whether automatically or in a manual check -- until the user has ticked a box. But according to users' reports at the time, Windows Update itself checked the "Upgrade to Windows 10" optional update as eligible for download and installation. Users with Windows Update set to automatically retrieve and install updates -- the norm, and the setting recommended by Microsoft -- or who did not examine the optional update list, were then served with the Windows 10 upgrade, whether they wanted it or not. Microsoft quickly issued a statement saying that the checking of the upgrade's Optional item "was a mistake." Mayfield contended that Microsoft has done the same this week by automatically checking the Windows 10 upgrade box. Under those conditions, it mattered not a whit whether the upgrade was listed under Recommended or Optional: The result would be the same. For the vast majority of users, the upgrade would download -- if it wasn't already on the PC, having been pre-loaded under a long-running campaign to place the bits on customers' devices -- and the installation process would begin. Microsoft has said that users could decline the Windows 10 upgrade once installation began, but has declined to say whether the upgrade starts in all cases, detail how the user authorization process is to play out, and whether -- after a customer declines the upgrade -- it presents itself again later. The company has been little help when asked to clarify exactly what began this week for the Windows 10 upgrade on Windows 7 and 8.1 devices. "We are committed to making it easy for our Windows 7 and Windows 8.1 customers to upgrade to Windows 10," Microsoft said in a statement forwarded by the firm's spokeswoman. "We updated the upgrade experience today to help our customers, who previously reserved their upgrade, schedule[d] a time for their upgrade to take place." In a follow-up email, the spokeswoman did not directly answer questions Computerworld posed, including whether the Windows 10 upgrade was being placed in Recommended, Optional or both. "This is rolling out in a phased approach which is why you are seeing different reports," she said. Mayfield noted that as far as he can tell, Microsoft has honored the registry settings it had earlier said would block the appearance of the Windows 10 upgrade on PCs powered by Windows 7 and 8.1. Those registry tweaks -- made by crafting a Group Policy that could be distributed to large numbers of machines -- were spelled out in a support document revised last month. That means Mayfield's GWX Control Panel will stymie attempts to place the Windows 10 upgrade in Windows Update, as the tool was designed to do. Previously, Mayfield had warned that might not be the case if Microsoft again changed the rules, an increasingly common practice for the company, which, for example, repeatedly issued a Windows 10 reservation app to users who had managed to uninstall it. "If GWX Control Panel reports 'No' for 'Are Windows 10 Upgrades allowed? ', then the Windows 10 upgrade doesn't even appear as an option in the Windows Update control panel," Mayfield reported. Those who download and install GWX Control Panel can block the Windows 10 upgrade from appearing by clicking "Disable Get Windows 10 app," and then clicking "Prevent Windows 10 Upgrades." Earlier this month, Microsoft said that it would expand Windows 10 upgrade distribution to include all systems running Windows 10 Home and Windows 10 Pro -- even domain-joined Windows 10 Pro machines in businesses -- that receive their security patches directly from Windows Update. It was also unclear today whether Microsoft is serving the upgrade to domain-joined PCs, which were originally exempt from the push, or only to consumers and commercial systems not connected to a network in which administrators use Active Directory to set access rights. GWX Control Panel can be downloaded from Mayfield's website free of charge, although he accepts donations from appreciative users. Microsoft is placing the Windows 10 upgrade on Windows 7 and Windows 8.1 PCs, but pre-selects the download, even though it's listed as an 'Optional" update/upgrade. That's contrary to how Windows Update's Optional items usually work, and was called a "mistake" by Microsoft when it did the same last year.